Most people who travel along Connecticut Avenue through Chevy Chase, Maryland, know “Chevy Chase Lake” as the residential neighborhood near the intersection of Jones Bridge Road and Connecticut Avenue. They may look for a lake, especially when they pass a sign for Chevy Chase Lake Drive, but longtime residents know that the man-made lake by this name was drained more than seventy years ago. In 1892, Coquelin Run, the small tributary which flows to Rock Creek, was dammed to create a source of water for the electric generating plant that powered the new streetcars on Connecticut Avenue. This man-made lake was on the east side of Connecticut, just south of Chevy Chase Lake Drive. Its primary use long gone, the dam was removed and the lake was drained. Today the steep terrain, dense vegetation, and a condominium development hide any traces of the former lake. Yet at the turn of the 20th Century, Chevy Chase Lake was well known across the metropolitan region. It was the “end of the line” for the Rock Creek Railway streetcars (later part of Capital Traction) which ran along Connecticut Avenue and ended just below a spur from the B & O Railway that ran towards Georgetown. A trolley turnaround, car barn and electric generating plant were located adjacent to the lake. Just as subway and bus riders know the names of the terminus of each line of the transportation systems today, residents of the District of Columbia and the surrounding areas of Virginia and Maryland knew of Chevy Chase Lake by the name on the front of the streetcar. Chevy Chase Lake, the amusement park by the same name, was privately owned and managed by the Chevy Chase Land Company. The park was an attraction intended to draw prospective land and home buyers to their new suburban development. It also kept the streetcars full in the evenings and on weekends. With picnic areas, a bandstand, dancing pavilions, a merry-go-round, and other amusements, it was open to the public from May through September, usually opening around Memorial Day and closing shortly after Labor Day, depending on the weather. Aerial View of Connecticut Avenue looking south, with Chevy Chase Lake on the left. Power house and car barn, and round pavilion next to the lake. From a slide lent by Robert Truax. CCHS 2008.255.12. Footing for the Bridge across Coquelin Run, east of Connecticut Avenue. From a photograph taken by Ed Heller. CCHS 2008.200.12. It was a pleasant ride out into the rural countryside, especially in the summer. And it was affordable, too. The price for a single streetcar ride was 5 cents, or 6 rides for 25 cents, in the early years -- the price went to 7 cents in 1919. As a young woman, Winifred Mason traveled on the streetcar system with her friends from Clarendon in Virginia to downtown Washington, DC, and then transferred to a streetcar with the “Chevy Chase Lake” sign. It was an adventure, she said, to visit the small amusement park around the lake. Chevy Chase Lake car, Capital Traction Co. #813, built in 1907 by Cincinnati Car Company. From a slide donated by William W. Duvall. CCHS 2008.144.06. 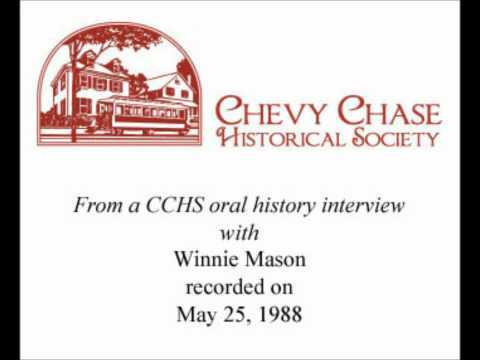 Listen to an audio clip from Winifred Mason's oral history interview by clicking on the Video link below. Learn more about each of the different sections in the exhibit on the Next Page. Let us know what you like about this online exhibit and what we can improve. All your comments are appreciated. CLICK HERE to send us a message.